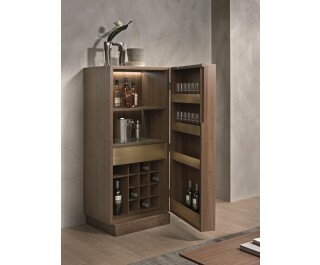 Cabinet with veneered and solid canaletto walnut structure. Inner partitions and shelves veneered and covered in leather, drawers and open units veneered with front in burnished metal. Wood or Cimento® (concrete C02 san d, C03 dove) doors. Available finishings: WG wengé, NK canaletto walnut.